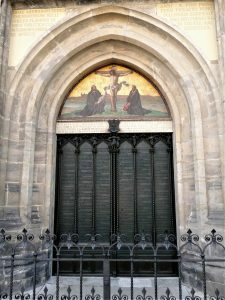 The wooden doors Luther nailed his theses to have been replaced by these bronze doors with the “95 Theses” cast into them. Personal photo. Many reforms have been good for us and looking back on them we applaud people such as Martin Luther, William Wilberforce, and Nellie McClung for their persistence in bringing about reform. But what about those who opposed their reforms? What is it like to be on the resistant side of reform? More pointedly, what if we are the ones people want to reform? Five hundred years ago on October 31, 1517, Martin Luther launched a critique of the Catholic church. Might there be any other “Martin Luthers” making a similar critique of the Evangelical church today? Any organization or movement inevitably calcifies from the “encrustations of time”1 and periodically needs reform that reinvigorates it, calls it back to its roots, and helps it focus on the right things. Calls for reform can expose our blind spots, mission drift, and untested assumptions. The Evangelical church has had a run of several hundred years, and who’s to say we ourselves are not in need of reform? A healthy church needs to be open to that possibility if it wants to stay healthy. Calls for reform should be examined, tested and, if valid, accepted. But even if not accepted as a whole, there could still be a part of the call to reform that points to opportunities for improvement. We shouldn’t dismiss our critics too quickly, because God could be using them to speak prophetically to us! how we engage in dialogue with people who oppose our convictions. Every call for reform gives us an opportunity to learn and become a better church. 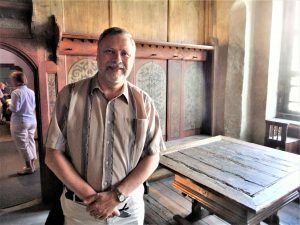 Let’s take advantage of the 500th anniversary of the start of Luther’s reform movement to see what the Evangelical church can learn from how the Catholic church responded to Luther’s 95 Theses. 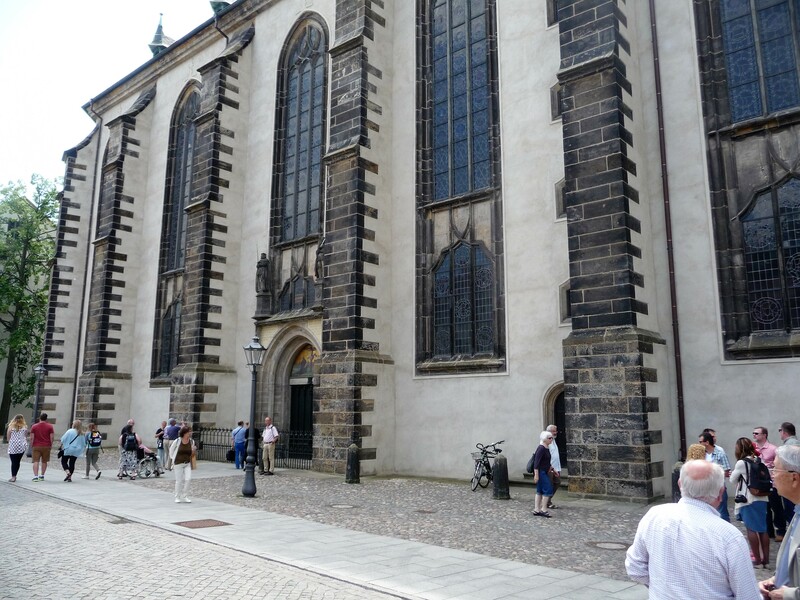 All Saints’ Church, Wittenberg Germany. 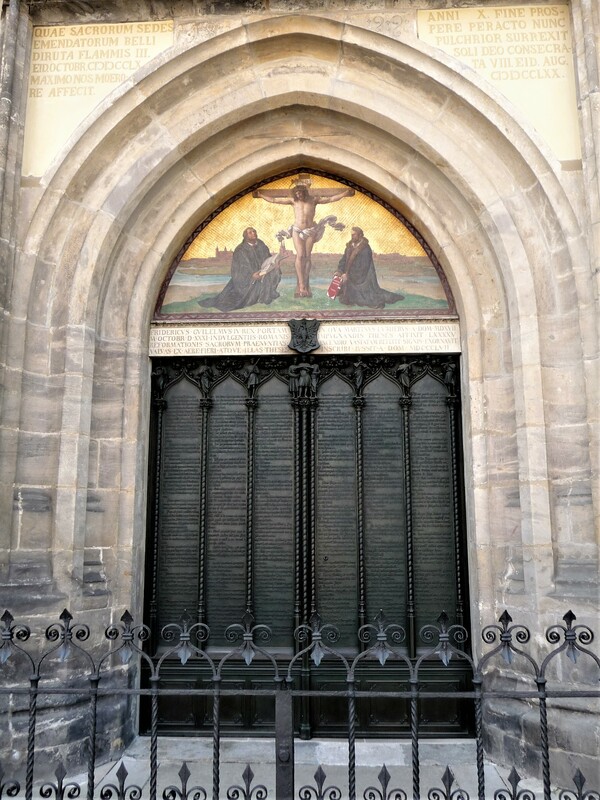 The door Luther nailed his theses to was the side door, pictured here and above. Personal photo. Nailing the theses to the door was not an act of defiance or protest, but was the accepted way that university professors announced topics they would like to debate. Martin Luther was a theology professor at the University of Wittenberg and he was not instigating a public uprising against the Catholic church, but a discussion about its problem practices. 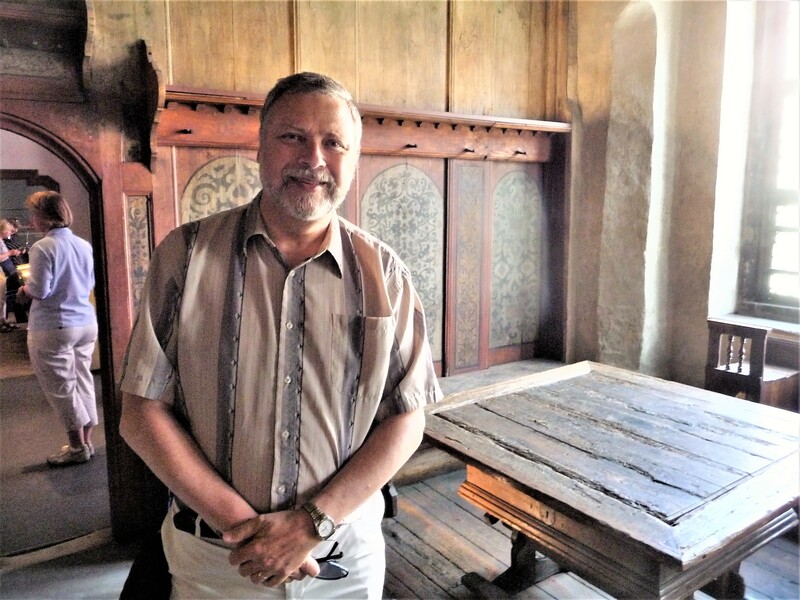 This is Luther’s living room and the famous table around which guests gathered to listen to and discuss Luther’s theological expositions. At this early stage of the Reformation, Luther’s goal was to reform the corrupt and abusive practices of the Catholic church at the time. He didn’t want to break with Rome. Had the Catholic church corrected the abuses and ended the corruption promptly, it is quite possible that Luther would have remained a Catholic. It was only over time that the break became inevitable. The turnaround time for the church’s response was an amazing 46 years! Luther died in 1546, just a year after the Council convened. The church’s delay meant that, even if he had been willing to participate in the Council, Luther died before it got to meaningful debate. 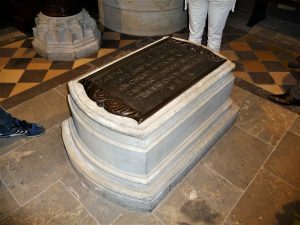 Luther’s grave. He is buried beneath the floor. Personal photo. During the 28 years of apparent inactivity on the Catholic side, the Protestants were very active, developing their own theology and then dividing into multiple camps as they argued over various theological matters. By the time the Council convened, there was no single Protestant leader or group to dialogue with, and a Protestant ecclesiology had solidified which did not include the papacy. The situation had become way more complicated than at the beginning. As the saying goes, it was too late to shut the barn door because “the horse” was long gone! Some issues aren’t all that significant and will disappear on their own. But a call to reform on a significant issue is likely to gain traction and be sustained over time because the reformers are heavily invested in bringing about change. Either the pressure will continue to mount for you to reform, or they will take matters into their own hands and move ahead on their own. The world will not stop and wait for you to plan your response. 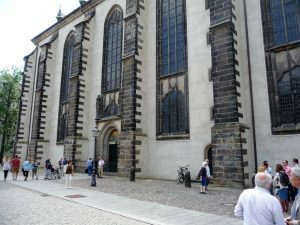 The Catholic church invited some leading Protestants to attend the Council and discuss their differences, even giving them an offer of ‘safe conduct.’ Very few came though, and then only for a short time, because just a century before, in 1415, Jan Hus had also protested the very same things that Luther was protesting, and even though he had been given ‘safe conduct’ to attend the Council of Constance to discuss his views, once at the Council he was tried and condemned, was scalped, and then burned at the stake! It’s no wonder that a ‘safe conduct’ didn’t mean much to the Protestants! We may have some history to apologize for. Be humble and get the dialogue off to a good start by acknowledging past actions that have made the situation worse today. It may take a while to build enough trust with the reformers to have a meaningful conversation with them. Part of the reason for the Catholics’ long delay in responding to the Protestants was that a response would require a church council, and popes had feared calling a council ever since the Council of Constance. In addition to condemning Hus, that was the council that decided church councils are superior to the Pope and could declare a pope to be heretical. Although this decision was overturned at the Council of Florence, popes were disinclined to call a council for fear it would get out of hand. Don’t let fear prevent engagement. Have faith that God is involved in your affairs and will support you through challenging times. If we’ve made a mistake, admit it and do the right thing. Our goal isn’t to save face, it is to be faithful. Pride will stop honest dialogue and self-examination in their tracks. The only way forward requires humility. John O’Malley, author of Trent: What Happened at the Council , wrote that “Each side could not help playing according to its own rules and therefore making demands on the other that required it to surrender or severely compromise its identity.” This pretty much guaranteed there would be no reconciliation. Engage in a spirit of inquiry with the goal of exploring and discovering what is right together. If agreement isn’t possible, you can always end in disagreement if necessary and still have made some progress or improvement. But you won’t get even that far if you create barriers to engagement. The first was a penchant for proof-texting, lifting statements, and even ideas of the Protestant Reformers, out of context, the result of an undeveloped skill in textual analysis. The second weakness was an underdeveloped sense of historical criticism, which resulted in the Council affirming apostolic origins for beliefs and practices where there were none, or where those origins were much less secure than the council intimated. Engage with intellectual honesty. Be sure to understand the other’s position completely, and to acknowledge weaknesses in your own position. For example, not every practice needs to be seen in the New Testament church to be valid. As I discussed in my book, The Church at Work, if that were the case there would be no room for the Holy Spirit to do anything new or for us to adapt to new circumstances that the early church didn’t have to deal with. 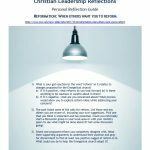 Calls for reform in the church should be taken as an opportunity for self-evaluation with the goal of becoming the best church possible. We don’t need to agree with everything others believe in order to learn something from them. For example, here’s an article by a reporter for the United Church of Canada Observer magazine explaining what the United Church can learn from Evangelicals. What could conservative Protestants learn from liberal Protestants? Perhaps they could help us think through how to do a better job speaking out on social justice issues. We do great with compassionate ministry, but tend to be uncomfortable with issues of systemic injustice. The real equivalent to Martin Luther’s reform movement would be those within the Evangelical church who are now drawing apart from it as they critique their Evangelical beliefs and practices. One such group is the highly controversial “emerging church.” I am no expert on this brand of Christianity, but generally they call for a more inclusive Christianity, one that is more focused on service than doctrine, and one that emphasizes love and grace over truth and sin. Even if we disagree or have concerns with aspects of their theology, could we learn from them about being present with those outside our faith and engaging them where they are at? A great vision for the Evangelical church is that it remain faithful to Christ and be both self-aware and self-correcting so that it is exemplary, healthy, and effective in mission. It would be open to critique from any source and use it to become a better church. Since there is no centralized structure to the Evangelical church, it is up to ministry leaders to show community leadership and dialogue with other Evangelical leaders with whom they are in relationship. Key Thought: Critics show us where there is room for improvement. Here’s a bonus for you. Martin Luther wrote and composed many hymns, but the most famous of them all is A Mighty Fortress is Our God (“Ein feste Burg ist unser Gott” in German). 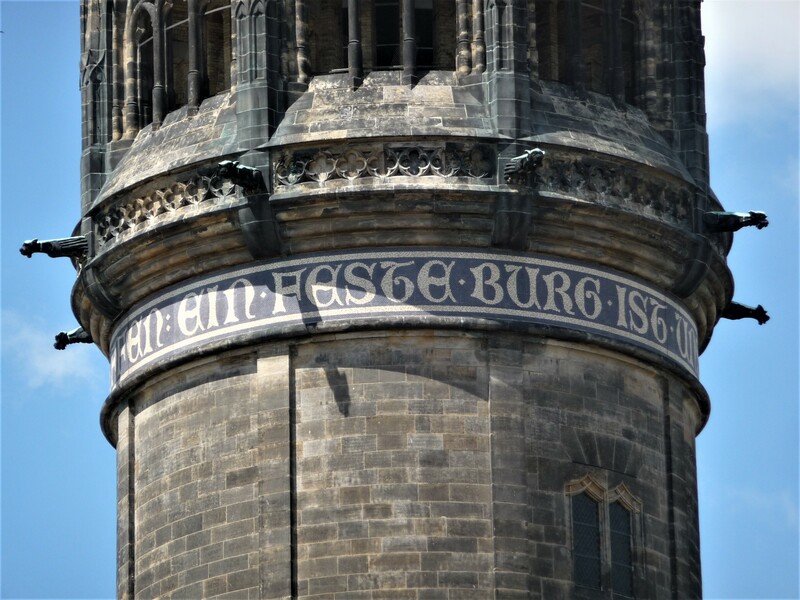 It captures Luther’s spirituality so well that the church in Wittenberg has it inscribed on its tower! The tower of All Saints’ Church with “Ein feste Burg ist unser Gott” inscribed on it. Personal photo. I recorded a 2 minute fughette based on the very memorable opening line, which you can listen to in the video below. Enjoy!